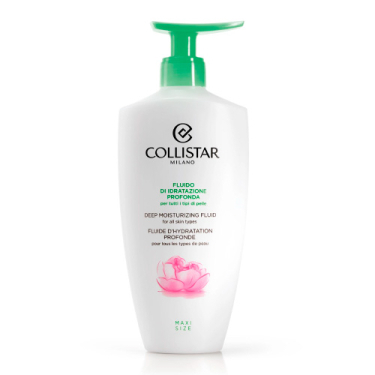 DESCRIPTION: Maxi Size Deep Moisturizing Fluid Body from Collistar is a deep moisturizing treatment that combines the efficacy of an advanced formula with an enhanced freshness and lightness of a fluid, instantaneously absorbed, which gives the body more smoothness, firmness and vitality. The results are due to the action of three moisturizing agents - Plankton Marine, Aloe and Hyaluronic Acid - hydrate intensely and steadily, guarantee the balance of the hydrolipidic layer of the skin in any weather or environmental conditions. The addition of Retinol, Vitamin E and unrefined wheat germ oil promotes an energizing and anti-aging action. Apply on the body with a gentle massage. It is recommended the application after bathing.